The Braaap is the progression in how a performance river running boat is defined. From the beginning, the Braaap has been paddled on the hardest whitewater our team could find. In fact, the day after making the first Braaap proto, Pat Keller and Eric Deguil loved it so much during a flat water session that they paddled it in the Green Race. Pat later took the Braaap to Mexico and won the first ever Extreme Waterfall World Championships. The Braaap's hull is derived from modern slalom boat design which gives crisp feedback to paddlers zipping in and out of eddies and while changing direction mid-current. The responsive hull, the ease of rolling and the Braaap's light weight create an excellent learning platform for novice paddlers while the speed and agility of the Braaap provide experienced boaters with downriver tactical controls. The Braaap has enough volume for all but your most challenging runs, yet it is small enough to control in the air, pivot turn, and surf like a dream. Once you dial this boat in, you will also find yourself tapping into squirts and splats. Jump in a Braaap and it will open up a completely new experience of how you play your way down the river. If your inseam is less than 32 inches, consider getting a FREE Blukhead Plate at checkout by adding the model specific B-Plate to your cart and using code FREEBPLATE. The larger B-Plate will replace the stock B-Plate giving you a better fit in your kayak. The B-Plate can be found under the Parts section in our online store. How does the Braaap compare to the Mullet prototype? The Braaap in very basic terms is a short Stinger. At 24.5 inches wide it is built for speed and agility. The difference from the Stinger is that is has a modern slalom hull design that makes it very nimble and fun to paddle. It does pivot turns really well so that you can change direction quickly. The rounder hull and deck make it a very forgiving river runner and more user friendly when boofing and working with rocks. The Mullet is a prototype that we are still working on that is the more playful and the larger brother to the Braaap. The bow of the Mullet is larger to accept larger feet and be more forgiving running the river. The stern of the Mullet is actually smaller or slicier than the Braaap which allows it to be squirted and splatted more easily. The Mullet has a very similar hull design but the mullet is an inch wider so it is more stable. Does the Braaap stern squirt? The Braaap does stern squirt but it is not a no brainer, stern squirt design. The extra volume that is throughout the boat that makes it a great river runner can make it a little harder to squirt and splat. You will need to develop your technique to get it up vertical. It is very good at low angle to 45 degree pivot turns for river running. What can I expect in my first run with the Braaap? Does it feel like any other boats that have been on the market? 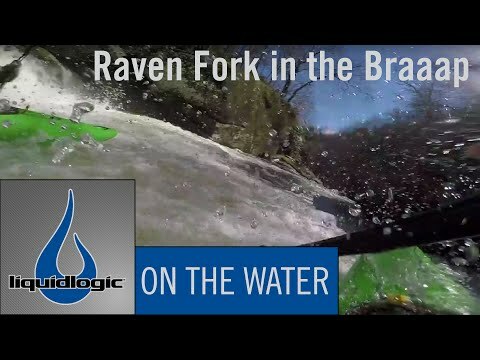 The Braaap truly is a different way to look at running the river. The narrow slalom hull design will make it feel less stable when you first get in the boat but once you feel the acceleration, and agility you will understand. The Braaap just wants to go fast, carve into and out of eddies, surf all day, and open your eyes to running the river in a completely new way.